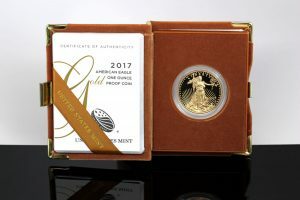 A CoinNews photo of a 2017-W $50 Proof American Gold Eagle. Prices on it and other collector gold coins from the United States Mint will increase Wednesday. Later today, Sept. 6, the United States Mint will raise prices on more than two dozen numismatic gold products. The U.S. Mint’s collections of gold coins have prices that can change weekly based on the trending value of gold as it compares against its pricing matrix. The Mint most recently raised prices on Aug. 2 when gold’s weekly average climbed above $1,250 an ounce. The precious metal has since traded near a one-year high and is now around $1,340 an ounce. The following table summarizes the U.S. Mint’s current and upcoming gold coin prices. The U.S. Mint has made nine prior pricing adjustments this year, increasing them six times and lowering them three times. Past adjustments have tended to happen on Wednesdays at around 2:00 p.m. ET.